Trend-spotters are convinced that in 2011, pie is the new cupcake, and two new Seattle bakeshops are busy proving those prognosticators right. At Pie, baker Jessamy Whitsitt and her partner Renee Steen have been wowing Fremonsters with the simplicity of their handheld sweet and savory pies since New Year’s Eve. That’s when they opened the doors of their take-away cafe for a few tentative hours “just to get a feel for it,” says Whittsitt. It felt great. 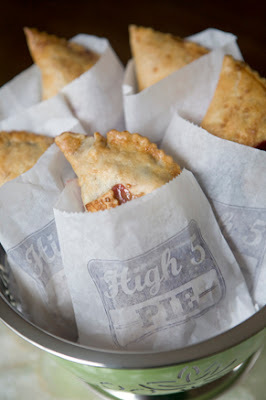 What began as a pie-in-the-sky idea is now their first foray onto the food scene. Whitsitt is a self-taught baker and personal trainer who grew up in Seattle; Steen a former Pixar film editor who left San Francisco to be closer to her friend and family. Baking since she could stand facing the stove, Whitsitt recalls the “funny aha! moment” last spring when, after preparing a batch of pretties for a party, she held one in her hand, looked at Steen and decreed, “I want these mini-pies to be the next cupcake!” It was a joke, she swears — until they got serious, formulating a business plan, finding a lease and moving into the shiny new shop in the heart of Fremont. Hold out your hand for a treat, at Pie: 3515 Fremont Avenue North. Their brief menu stars morning hits like the meatless huevos breakfast pie, and best-sellers like their English meat pie built with ground beef, mushrooms and onions. Keeping up with production has been a challenge. “We literally sell out of everything, constantly,” says the baker whose apple pies are the breakout favorite among the sweets. Catering to the lunch bunch, they’re selling combos ($8.50): a savory pie, soup or salad, plus a “Mini Mini” sweet pie. Betcha can’t eat just one. Mini Minis, at Pie. Dieting? Try one of those silver-dollar-size minis. l broke my New Year’s resolution with the chocolate peanut-butter version ($1.50) whose flaky all-butter crust cries out for a Victrola Coffee chaser. Out late? Pie (open Tuesdays-Saturdays 8 a.m.-7 p.m. and Sundays 11 a.m.-5 p.m.) hoists a late-night window Fridays and Saturdays from 9 p.m. till 2 a.m.
New Year’s Eve also marked the debut of High 5 Pie, on the corner of 12th and Madison on Capitol Hill. Come sit a spell — at High 5 Pie: 1400 12th Avenue. That high-styled bakery and cafe is fueled by baker Dani Cone — the name behind Seattle’s own Fuel Coffee. Cone is a local entrepreneur with a long history as a barista (she’s been pulling espresso since she was 15 and has plenty to say on the subject in her book “Tall Skinny Bitter: Notes from the Center of Coffee Culture”). 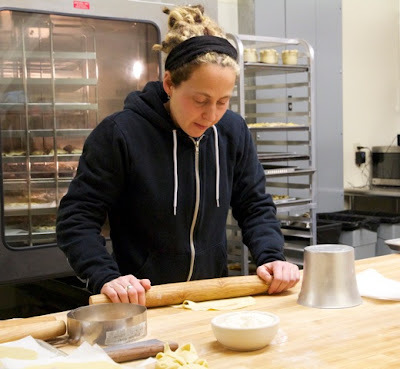 Dani Cone rolling her own in the kitchen at High 5 Pie. What started out as a sideline business (perhaps you’ve sampled her butter-crusted “Flipsides” at Fuel, Caffe Fiore, Caffe Vita or Stumptown? ), has morphed into a sweet (and savory) obsession that has Cone working 16-hour days in her new bakery kitchen. 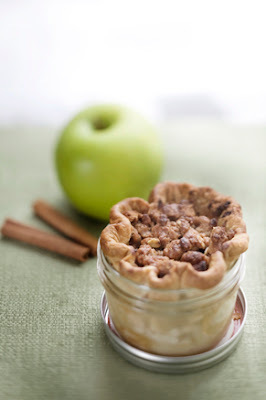 Here, she’s rolling out her grandma Molly’s pie-crust recipe and helping her crew stock everything from “Cutie Pies” (baked in a muffin tin) to Piejars (in mini-Mason jars) to whole pies (in an array of creative flavors and sizes, from a 7-inch deep-dish to a “Mile Wide” that serves 40). Waste not, want not? Here, you might down a few “Pie Fries” (way to use dough scraps!) or leave with a handful of Piepops (a bite or two of “pie” disguised as a lollipop). In the mood for a fiesta of flavors? Do as I did and try a Frito-pie Flipside, whose flavors bring to mind the kind of enchilada casserole you wish you’d find at a potluck. Gluten-free? They’ve got you covered there, too.